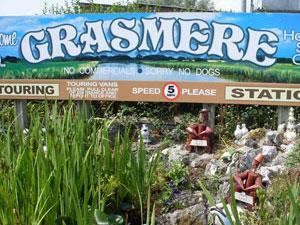 Grasmere Holiday Park01493 720382work01493 377573fax Holiday & Touring Park (SC)Grasmere Holiday Park in Caister near Great Yarmouth is a quiet, family run site with static caravans and one chalet available for hire. Grasmere Holiday Park in Caister near Great Yarmouth is a quiet, family run site with static caravans and one chalet available for hire. Freeview TV. Small outdoor play area for children. Laundry facilities onsite. Supermarket, restaurant, pubs, takeaways, gym, swimming pool, beach, golf course all within half a mile. Greyhound/stockcar racing 1 mile, racecourse 2 miles, bus stop 500 yards takes you into Great Yarmouth Town Centre and seafront (3 miles). Children welcome from any age.